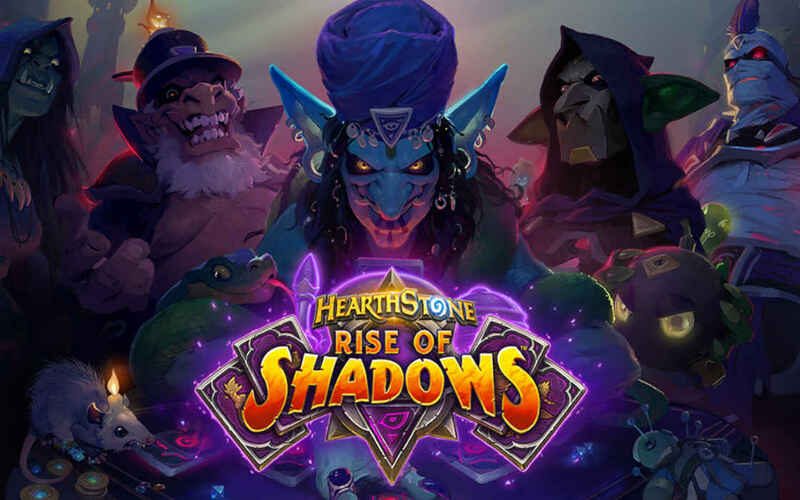 As we prepare for the release of the Rise of Shadows, Hearthstone’s latest expansion, four new cards have been revealed. We take a look at those here. 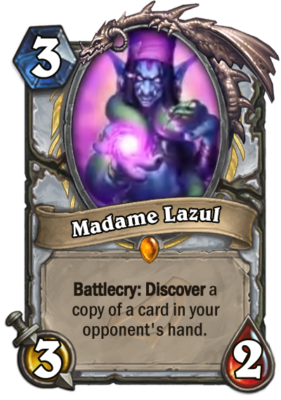 Madame Lazul is the latest instalment in the Priest power lore. Summoned at 3 mana, this 3/2 minion is certainly not the best one you can play. However, you can use it to do a fair bit of scouting and uncover one of your opponent’s hand-held cards. There are definitely upsides in knowing what an opponent might play, be that even a single card and that’s why Madame Lazul has its charm despite her fragile nature. Building a strategy in which you try to limit your opponent’s future moves makes Madame Lazul a strong pick at almost no cost. Rafaam’s Scheme – Bring Forth the Spawn! 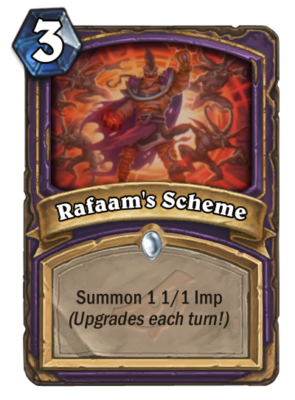 Enter Rafaam’s Scheme, a card that will be played by a Warlock and summon a modest and quite fragile imp army. The card allows you to summon three 1/1 imps over the course of three individual turns. The little devils are quite fragile and they will be wiped by any AoE spell and most available minions. And yet, we can see how this card can be useful to anyone playing against less experienced players. Amassing a small army of imps can be a little disruptive, especially against a deck that hasn’t balanced very well between foot soldiers and castable spells. In any event, any buff spells will quickly help you bring up the little devils up to speed, so proper deck building may just make a useful card out of Rafaam’s Scheme. The Omega Devastator can quickly turn to be a heavyweight hard-hitter in the later stages of the game. He will cost you only 4 mana crystals to summon and coming with a decent 4/5 stats too. If you have 10 mana crystals, though, you can burst down a minion, dealing 10 damage in the process. 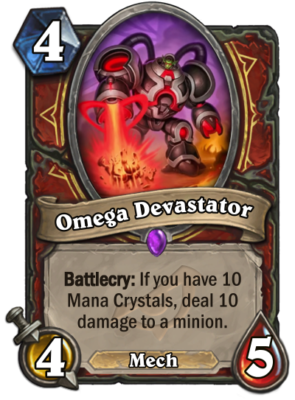 If you manage to play the Omega Devastator around cards such as the Omega Assembly and Dr. Boom, you will be building neat synergies to last you for a fair while. Warriors are all about boosting morale, or failing that – crushing it. The Improve Morale card lets you inflict 1 damage to a minion. Should you fail to kill it – shocker – you would get to draw a Lackey to your hand. Coming at a very low cost, there is some hoping that this card can be used well, allowing Warriors to add even more removal spells to their hands. 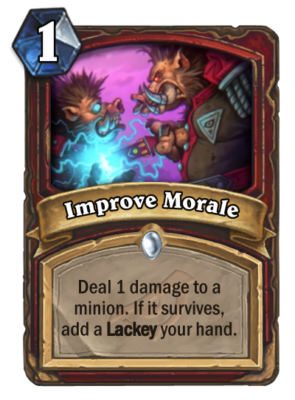 There will be definitely card that will fit well with Improve Morale and depending on how the meta changes, we can witness a slightly different build for Warrior centered around the Lackeys. Four new cards for the upcoming Hearthstone expansion Rise of Shadows have been revealed. Depending on how the meta changes, they can be useful.